Everyone is always looking for the next great sire. That sire that is going to leave them with the #1 daughter or son on the lists. 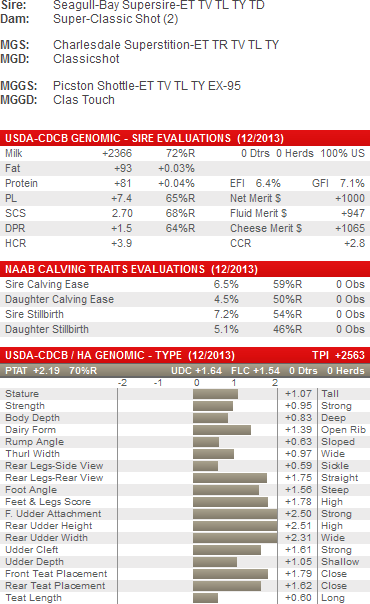 The problem is with everyone using the same exact sires, from the same exact lists it can be hard to get ahead. That is why you need to find those sires that have the ability to leave you with the extremes. Outlier sires have the ability to throw you the son or daughter that is extremely high on genomic lists, well above parent averages and have what it takes to top the charts. But they also typically have the ability to miss the mark. They typically have the tendency to through you the largest extremes, so for every list topper they will leave you some that don’t measure up. Why this is acceptable is that in today’s genetic marketplace, the revenues from the one list topper typically make up for the costs of the others that don’t measure up. The following are the top 10 sires we found that offer the greatest rate of acceleration with the ability to produce the extreme son or daughter. Every now and then there comes a sire that seems to come out of no where. Alta1stclass is one of those sires. 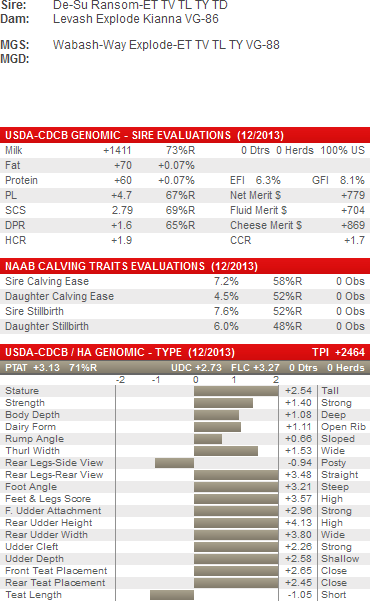 From a cow family that many have not heard of, Alta1stclass is certainly a development of the genomic era. 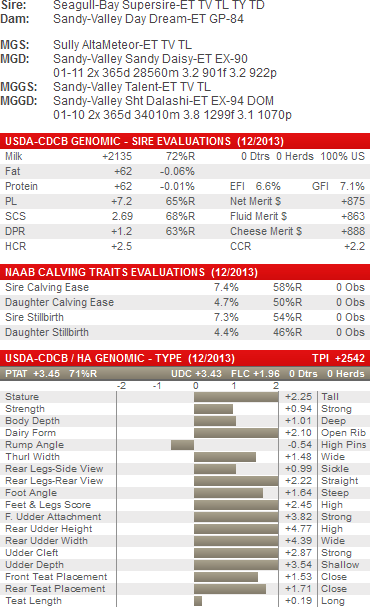 Alta1stclass is the 3rd generation in his family to score at least 5% higher on their DGV’s than their parent averages. That is saying something in today’s current calculations where those progeny that test at the extremes are regressed back to the rest of the pack. While not a high production sire, Alta1stclass has strong components and functional type. 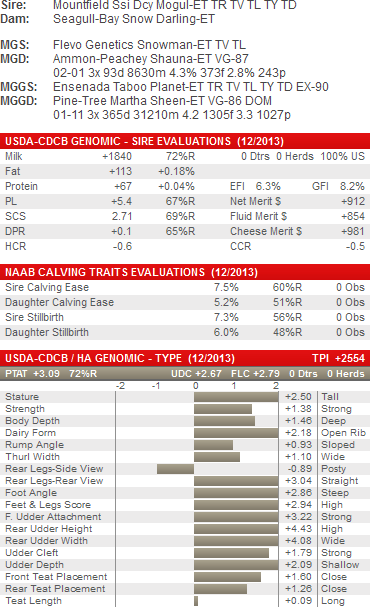 Those looking to breed the next VG-89-2YR will not be impressed with his dairy strength scores and his loin strength. Alta1stclass will give you strong components, high functional type and great health and fertility. Which when mated correctly will sure leave you the next generation of extreme progeny. With a sire stack that reads like a who’s who of the genetics world, it’s not surprising the Rubicon will have the ability to throw you the extreme list toppers. In fact the cow family behind Rubicon has been doing that for many generations with his 2nd dam being SANDY-VALLEY PLANE SAPPHIRE VG-87-2YR-USA. Rubicon has extreme components with a combined Fat and Protein of +153 lbs and add to that over 2.50 on Type and he is in rare company. But what really make’s Rubicon stand out is his sire stack that demonstrates the ability to sire extremes. Similar to Rambo, Rubicon’s Chromosomal PTA’s would indicate that he will make a much better sire of bull mothers than a sire of sons. For those of you who are looking for an outcross sire who packs a punch, LADD MAN is your guy. 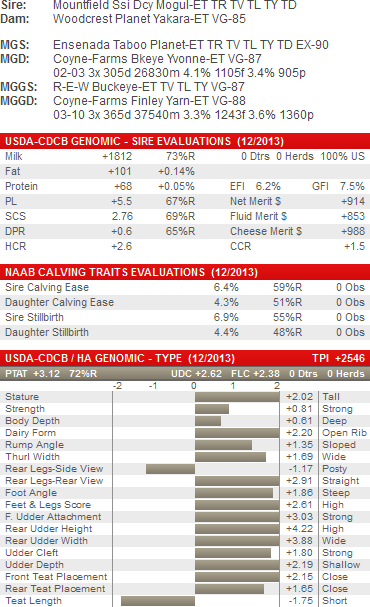 With extremely low inbreeding and relationship values Ladd Man is certainly the high outcross sire and he is polled. Don’t let the Man-O-Man in the pedigree confuse you when thinking he may not be an outcross sire as he gets approximately 72% of his genetics from his sire Ladd-P Red and only gets about 8% of his genetics from Man-O-Man as opposed to the expected 25%. While certainly not a production sire by any stretch of the imagination, Ladd Man has strong percentage protein improvement, solid type and very desirable health and fertility traits. 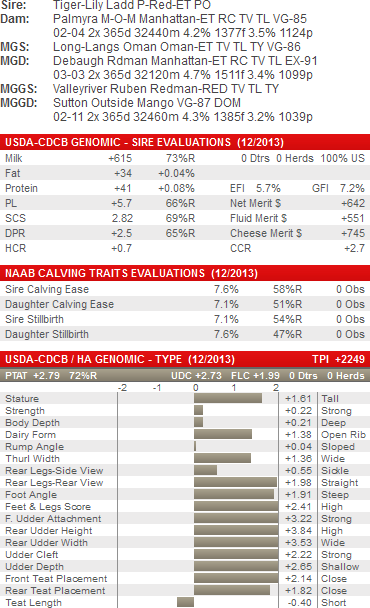 For those breeders looking for an outcross sire to use on your high production cows, Ladd Man-P is perfect. If you are looking for more milk that Ladd Man offers then Octavian should do the trick. With a genomic test that is 6% higher than his impressive parent averages, Octavian will certainly leave you some chart toppers. At almost 2000 lbs of milk, over 170 combined lbs of fat and protein and over 2.70 for type and strong health and fertility traits, Octavian is the balanced sire that does it all. More importantly Octavian is the top balanced breeding sire to get more of his genetics from his father than his maternal side. Which has proven by sires like O-Man to be a key factor in being able to sire the next generation of sons. Looking for a shot of production? Then Supershot will score well for you. The pedigree behind Supershot is certainly not well known among breeders with last 5 of his 8 generations coming from Dutch breeding. Behind that is the US cow family at Vir-Clar Holsteins, tracing through the highly acclaimed Tirsvad Patron Claire EX92. He hails from the same line as the famous Koepon Classy’s and Anderstrup Claire family, known throughout the globe for its ability to breed high-ranking females and bulls on numerous different bases. Supershot has an extremely high genomic test and his pedigree indicates that he should be able to sire those extreme production daughters many breeders are looking for. 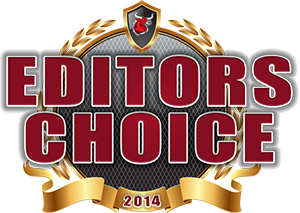 Supershot is also the #1 genomic sire for Net Merit $ 1000. Supershot should be protected on milking speed and dairy strength. If milking speed is a deal breaker on Supershot, then look to Yoder. Yoder is the extreme sire that is sure to ring the bell. His genomic test is 7% higher than his parent averages and his production predicted daughter deviations are some of the highest in the breed. 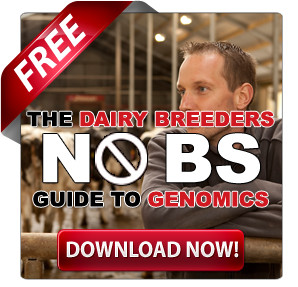 (Read more: The Number That Will Change the Way You Look At Genetic Evaluations Forever…) While results are sure to be highly variable, Yoder will certainly be worth taking that shot on with a large framed high production cow from which you are looking to produce that next generation of extreme production daughters and sons. 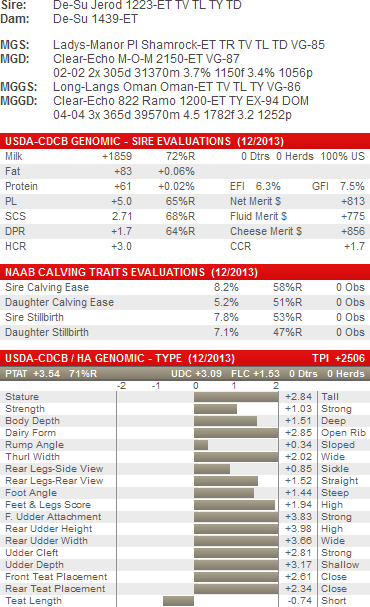 How many genomic sires are over 160 lbs of combined fat and protein and over 3 points on type? Two Yoder and Silver. Since Supersire put Seagull-Bay on the map (Read more: Charting the Right Course at Seagull Bay Dairy) everyone has been watching to see just who was going to be the next impact sire from this genomicly gifted family. Now comes Silver who may just have a greater impact than even Supersire has. Silver is a Mogul from the Snowman sister to Supersire. Like Supersire, Silver has the ability to leave extreme production. And just like Supersire he will have a significant impact as a sire of sons as well. 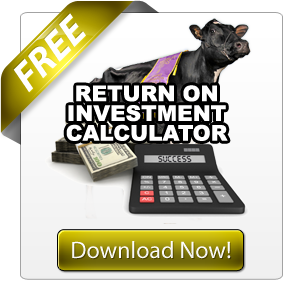 Ranking in the top 1% of the breed for Milk, Fat, Protein, Type, and Udders tells you that Silver is going to make a lot of noise before all things are said and done. 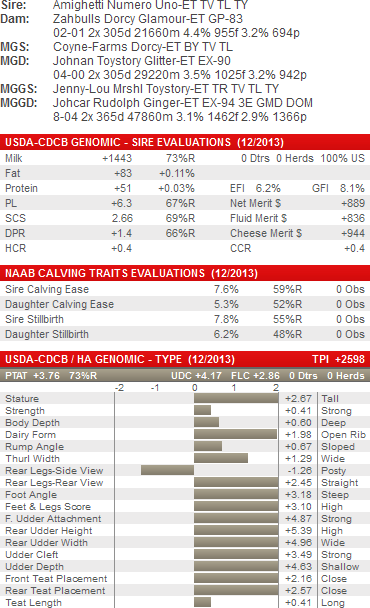 At over 1.0 for DPR and 2 points for HCR and under 8 for all calving traits combined with under 2.70 for SCS it’s no wonder that Dreamweaver daughters are going to last (+7.2 productive life). To go with that Dreamweaver is over 2000 lbs of milk, over 120 lbs of combined fat and protein and over 3 points on type. Not surprisingly he comes from a cow family that has made many dreams come true, as he comes from the SNOW-N DENISES DELLIA EX-95-2E-USA GMD DOM 5* family, well known for their ability to produce long lived sons and daughters. Dreamweaver should be protected on body depth, set to their legs and angle of their rumps, but nothing that will interfere with the ability to last many long productive lactations. 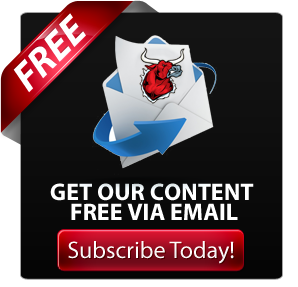 In addition to Rambo, Kobra is an extreme health and fertility sire worth looking at. Extreme components, and high type combined with breed leading health and fertility traits has this cow family emerging on every ones radar. While not a family that contains generation after generation of VG or EX it is a family that test well genomically. 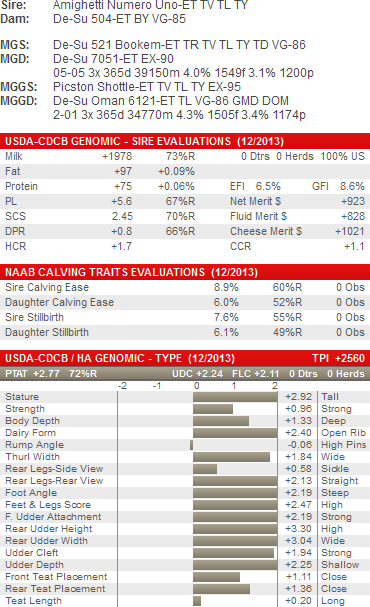 With Kobra being the third generation at least 5% higher on their genomic test than their parent averages. 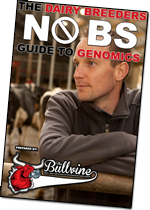 In this era of pushing the genetic envelope those breeders looking to stay ahead, or at least at pace with the large genetic corporations are going to have to use outlier sires. 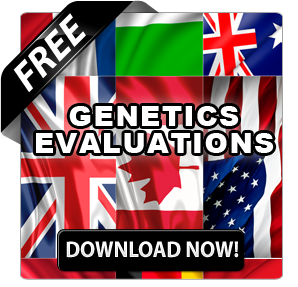 Sires that themselves have made significant gains over previous generations and have been genetically gifted the with best their parents had to offer. Breeders are also going to have to exit the land of the safe and start using sires that throw more extremes. These 10 sires are just those sires. These sires are the 10 outlier sires that will give you the greatest chances at winning the genetics race.